Those of you who attended last week's webinar "Tennis - Optimizing Performance" had a chance to become acquainted with both Stephanie Nihon, (the presenter) and the BFE's own Jon Bale, who joined Stephanie online to moderate the event. During the webinar, Stephanie shared her expertise in incorporating biofeedback and neurofeedback into the training regime for tennis players. She recently worked with the BFE to create the Tennis Performance software suite that leads the user through assessment/training protocols with screens specific to the sport. Dr. Vietta (Sue) Wilson is well known as one of the top sport psychologists in the field of performance enhancement with biofeedback and neurofeedback. There are several clinicians who have protégéd at her side, training athletes, determining protocol specifics for individual sports and fine tuning her method. Stephanie Nihon is one of those such individuals. As a former national athlete, Ms. Nihon has been involved in optimal performance training for almost 10 years. Working closely with Dr. Wilson, as well as at Michael & Lynda Thompson's ADD Center in Toronto, Canada, she has experience in all types of sports with specialties in tennis, swimming, hockey and most recently downhill skiing. Her experience includes training Olympians, NHL players, PGA golfers and National level athletes. The Tennis Suite was designed by Stephanie Nihon and the Biofeedback Federation of Europe (BFE) as a training tool for the performance enhancement of tennis athletes. Specific protocols are given, as well as exercises and enhancement goals. Ms. Nihon and Jon Bale, the BFE's Research Manager, both agreed that there is sometimes a lack of creativity on the part of clinicians or trainers when working with athletes. In developing the Tennis Performance software, her/our goal was to give clinicians new ways of teaching and enforcing what an athlete needs to learn. 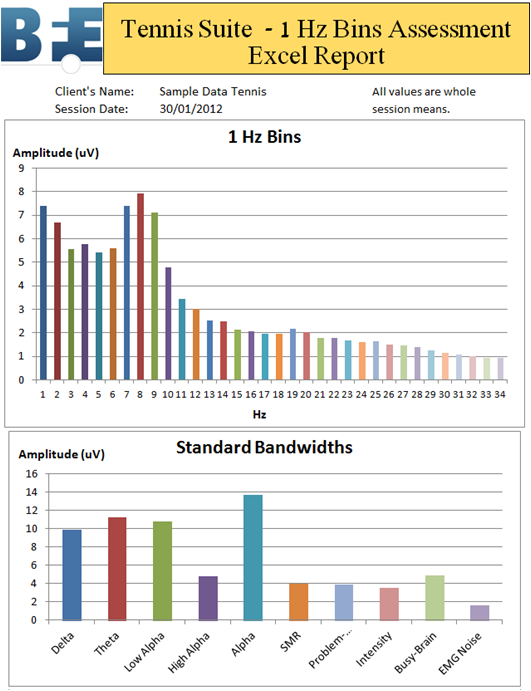 The Tennis Performance suite consists of a short 1 Hz Bins EEG Assessment, with specialized excel report, and 6 training protocols that focus on specific modalities. All training goals, exercises and feedback is done with relevance to the game of tennis. The 1 Hz Bins EEG Assessment provides an idea of the athlete's EEG amplitudes before training, as well as points out any anomalous readings. The results are graphed in an easy-to-read excel report that is generated automatically. The training protocols are divided according to complementary modalities are statistics. Within each protocol are multiple training goals and exercises, that go from simple to more difficult. 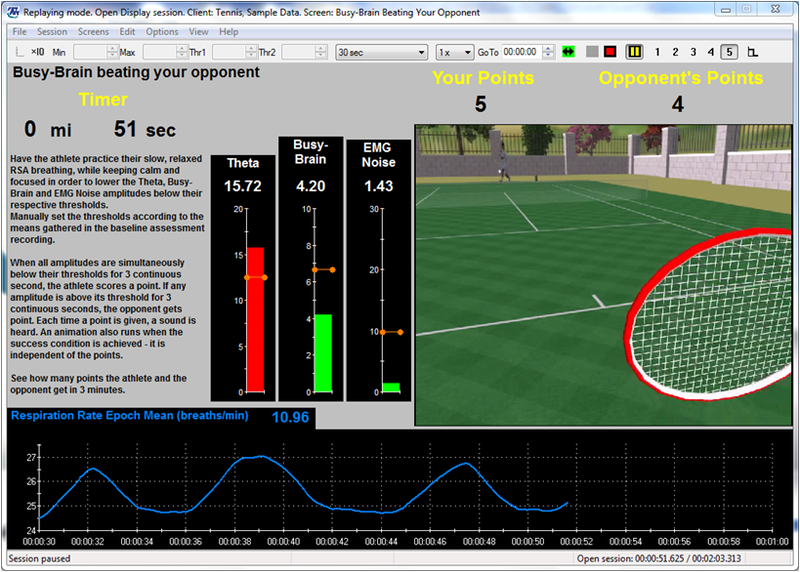 Exercises are interspersed among the training goals to facilitate faster learning with the biofeedback/neurofeedback. Instructions are included on each training screen so that the clinician/trainer and athlete understand what the goal is and how to interact with the feedback measurements. 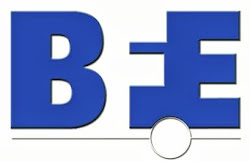 The BFE Tennis Performance suite is available for direct download from the BFE Online Shop. Documentation includes a software manual, clinical manual and additional reference files for exercises provide by Ms. Nihon. The Tennis Performance suite is available for use with the ProComp Infiniti or ProComp 2 encoder and is compatible with the BioGraph Infiniti software. Sensors used for collecting data and training optimal performance include BVP for heart rate, respiration, EEG-Z for brain waves, skin conductance, MyoScan-Pro for EMG (2 for ProComp Infiniti; 1 for ProComp 2) and temperature (for ProComp Infiniti only). Download tech sheet here. If you missed the webinar you'll be pleased to know that for a limited time, we have made the recording available at the special price of $9.95. (Regular price $29.95) Click here to purchase.